Completed My First Stroller 5K at See Jane Run Half Marathon and 5K! 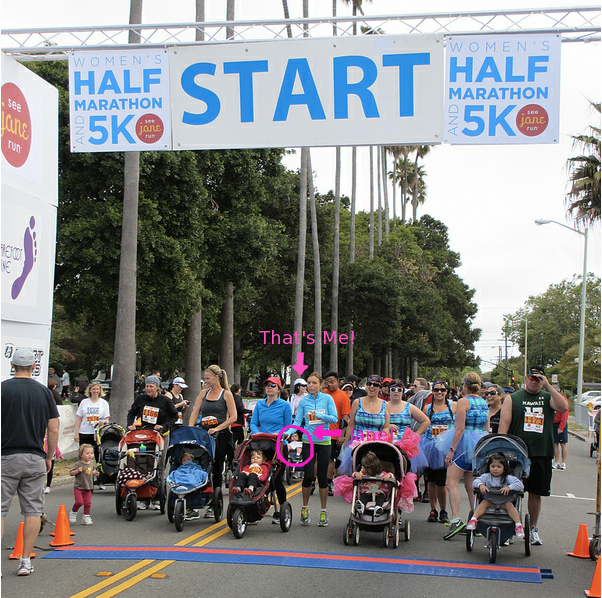 I completed my first ever stroller 5K with my daughter in the stroller at See Jane Run’s Half Marathon and 5K. It was really fun, and I prepared for this mentally a lot more than I did physically. Sure, I did run 5Ks on the treadmill, but I was not able to do it with a stroller beforehand. I researched race etiquette, so that even though I am new, I would not act like one. My husband bought me a cute outfit to run in, and I felt happy wearing this outfit. On race day, I didn’t have the luxury of arriving super early like my friends. Luckily, my husband was ready to be there to support me, and to drop me off so I didn’t have to worry about parking. Alameda is not too difficult to park in, but when you are dealing with a baby, it does save a lot of time to have drop off! Immediately upon arrival I can see that See Jane Run is a newbie-filled race. I can tell because a lot of people are wearing the red race t-shirt. Oddly enough, most of the stroller pushers like me worn our own clothes — I think most of us didn’t have time to get the t-shirt before the race! The race has a fun and energetic atmosphere. My runner’s high kicked in quite strong and I was cheering on the other stroller mamas that I see after I turned around at the 5K half way point. I crossed the finish line happy and exhilirated, though I soon learned that sometimes people get into “bite me mode” instead and not everyone is happy after a run/walk. I had quite a hard time finding the t-shirt and goodie bag line (and was yelled at by some woman who was upset that her heel was touched by my stroller wheel when she stopped in front of me abruptly. It was a buzz kill somewhat, but I apologized and stayed cheerful (careful to let a few people go in front and between me and the angry lady at the line… and the line was a darn long one. My husband and son came to meet with me at the finishing festival area. After I got the t-shirt and goodie bags we moved along to the playground area, where I sat and breastfed Jane while I watched my son play with my husband. It was a wonderful Sunday morning. 1. The 5K Stroller Run chip time is the same as gun time even though the strollers started 15 minutes after the regular 5K folks. I noticed this because I tried searching for myself after paying $1.99, upgrading to premium on the iPhone app. I searched for myself under the 5K Stroller Run category and couldn’t find myself. Then I just did a browse of the category and noticed that there isn’t a single person in that category! I looked up a few friends who were also running the 5K and 5K Stroller and found that the problem seems to be for all the 5K Stroller folks. All the Stroller 5K runners have the gun time and chip time the same. This seems to defeat the wearing of the chip. I am not a stickler for time, but I did time myself since it is my first stroller run, and my time is around 36-36 minutes. 2. The iPhone app course map only lists the mile markers, not the parking, music, or any other information. 3. The iPhone app mobile app faq section has test questions in there instead of real questions and answers. I guess this app was not properly tested? My next run, Run-to-Play, will be the coming Saturday at CVHS. This one is not a stroller friendly run, though it is practically next door so no need to drive!